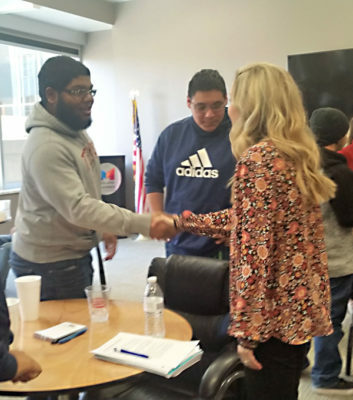 In Spring 2019, Communities In Schools of the Permian Basin, Big Brothers Big Sisters of the Permian Basin, and the Midland Chamber of Commerce joined forces to launch Beyond School Walls, a mentoring program that takes students to the mentors, as opposed to mentors going to the students. Twice a month, 20-25 at-risk high school students in the Communities In Schools program (12 from Midland High and 12 from Lee High) travel to the Midland Chamber of Commerce offices. In a group setting, students learn about professional topics such as goal setting, business and personal etiquette, building a resume, interviewing skills and career planning. After a group presentation, the students break into smaller groups of two or three students per staff member to practice what they just learned. There will be a cycle each semester (Fall and Spring) which will involve 5-6 sessions with a different business. Big Brothers Big Sisters and Communities In Schools will continue to identify partnering businesses to host Beyond School Walls sessions. WANT TO HELP US BRIGHTEN THE FUTURE? To contribute financially to our efforts to support our at-risk students, click here to make your donation. Volunteer opportunities are specific to each school. Visit here to see our list of participating schools. Welcome! We invite you to get involved in our mission through your time, treasure or any other consideration. If you would like to reach out to us to receive more information or have feedback, contact us here. The mission of Communities in Schools of the Permian Basin (CISPB) is to surround students with a community of support, empowering them to stay in school and achieve in life.